11/29/08 Algernon passed away yesterday unexpectedly from rapid onset pneumonia and septicemia due to unknown causes. We grieve the loss of this special boy. Hi! 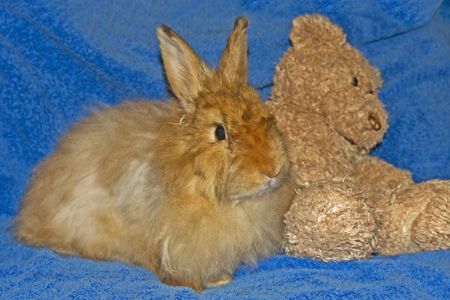 My name is Algernon and I am an EXQUISITELY HANDSOME neutered, purebred Red Satin Angora. The only reason I mention that I am a fancy "purebred" is that many people think that they need to go to a breeder or pet store to get a specific breed of bunny, but actually only any type of rabbit you want can usually be found in rescue or at shelters. You'll save money and also save lives by adopting, not buying. I am a very happy, outgoing and active boy who craves attention. I'm comical, sort of nosey about what's going on around me, and basically a really fun, great bunny. If you knit or spin, my fur will make beautiful fiber---especially when you lovingly and tenderly groom me. What's important to remember is that I MUST be groomed daily or my fur gets very matted. I arrived at San Francisco Animal Care and Control very matted, because my human could no longer care for me and I needed to be shaved and get extensive clean-up grooming.My fur will be stunning soon. I am such a character that I will make you laugh with my antics as you "ooh and ahh" over my silky fur and good looks.